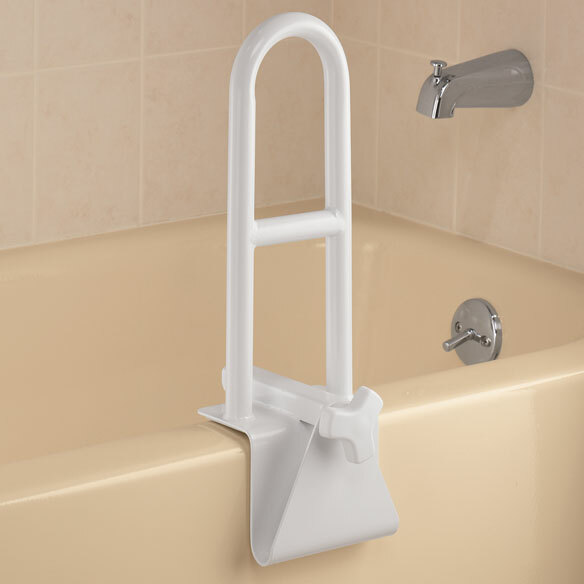 Adjustable tub grab bar provides safety and security as you get in and out of the tub. Supports weight with center bar and top loop; clamp design installs easily. Powder-coated steel prevents tub grab bar from rusting; rubber pads protect surface. Supports up to 250 lbs. Bar rises 14 3/4" above tub; clamp adjusts 3-7" W to fit most tub walls. This tub rail is exactly what I needed. It grips the tub tightly and I use it as a toilet bar (sink on other side). It is just the right height (adjustable), takes up no space on the floor and I don't know why I didn't think of one of these long ago. I was surprised and pleased that this was a heavy, solid piece of equipment. The handled screw portion opened easily to fit on the side of my tub and it was easy to screw the device in the opposite direction to mount it SECURELY on the tub side. It absolutely was secure on the side of the tub. I would recommend this item to anyone, young or old. I feel much safer with this on the tub side and since I live in an apartment I can remove it and take it with me if I need to move. Exactly what I needed. Was a bit difficult to get on the tub-screw is stiff. Flip side is that it's really secure on the tub. Only thing I would add is a textured grip as the enameled surface is a bit slick for wet hands. Also is helpful as the toilet is next to the tub so the bar does double duty to help with rising off the toilet as well! I can actually get in and out of the tub on my own now!!!! Had trouble getting in and out of bathtub shower. Now I feel completely confident with the use of this great device. I have this product, but did not purchase it thru this company. I had it before I saw it here. I just wanted to add my opinion anyway of this GREAT, FALL PREVENTER, product. I had a total shoulder replacement and this helped so so much. So easy to use and move and reuse. I paid a little too. My 90 & 89 year old parents love it! The product is very sturdy and easy to install. Now it won't be so hard getting themselves in & out of the tub! helping my mom gets in and out of shower tub so easy. Thanks easy Comforts. I sprained my knee - this provides the support I need to get in and out of the tub. I bought this to help me get up from my bath lift and get out of the bath tub. It works well and I can get in and out of the tub by myself using this product.I haven't had it long enough to know if it will rust, but it looks good to me. Durable and easy to Assemble. I purchased one of these tub bars several years ago. It developed rust in several places so I ordered this new one as a replacement. I hope it doesn't rust like the previous one. This new one has a new design so maybe it's better. Tubs have smooth sides. This product has a screw mecanisim that applies pressure against the side of the tub. No matter how tightly one tightens the screw the product tilts in one direction and slides off. There is nothing for the pressure of the screw mecanisim to grip. The other ditection works just fine. It needs someone very strong to tighten the Hand Screw then STILL tilts. WILL slide off. Very helpful for safely getting out of tub. This offers support to my elderly parent when entering / exiting tub/shower. Again I purchased for my sister because she needs additional help in the shower, and I had one lone years ago but it got rusted. Concerned for both husband and me as we get older and less agile. will help my elderly mother get out of the bathtub more easily. Seemed easy to install, is not permanent and got good reviews. My tub is very deep... my healthcare worker suggested this for my safety. Getting out of the tub is difficult for me, and I'm always afraid I'm going to fall. A necessity for my dad to help him get in and out of the bath tub. Seems to be a good solution to help my 92 year old mother-in-law get in & out of her bathtub. Have a similar tub bar, but it rusts so want to try this rust-free bar. Had one they work good !!!!!!!!! Saw it in a brick and mortar drugstore and checked it out. It looked like it would work for me so I looked it up and ordered it from a vendor I was familiar with. Extra safety for guests ! Elderly people need all the help they can get. A friend has one and loves it. To make things easy for my wife. For safety and security getting in and out of tub. I need it to lift my body. can it fit over a shower door rung when shower doors have been removed? BEST ANSWER: Thank you for your question. This is not designed to go over something. The tub side would have to be flush or flat with no obstacles as shown in the photo for the item. We hope this information will be of help to you. BEST ANSWER: Yes...my tub is fiberglass and it works perfectly! After I fell and had 4 compression fractures in my back I bought this tub grab bar. I love the security I feel getting in and out of the tub. I would recommend it and you will be glad you ordered it!. I have the tub bar and it works very well. My tub is fiberglass and I've had it refinished twice. The bar is sturdy and does its job. This works great on a fiberglass tub. My wife loves the one in her bathroom. She uses it everyday to help her get out of the tub. yes it doees. I have had mine on my tub for approx three years now. Yes, I have a fiberglass tub. It's literally a life saver. when sitting in tub can you pull yourself up? BEST ANSWER: Thank you for your question. It supports up to 250 lbs. If you are under that you can use it to lift yourself from a sitting position. We hope this information will be of help to you. Yes, as long as you have it tightened enough that it doesn't move when you put pressure on it. can it be used the easy grip adjustable tub bar be used on a fiberglass tub? BEST ANSWER: I'm not sure I'd use it on fiberglass. You have to tighten it pretty hard to get a solid fit so it doesn't move when you lean on it, and it's a lot of pressure on one small spot, so it may break the fiberglass. Maybe if you put a small piece of wood between the tub and the screw it would spread the pressure across a larger area, and that might work. Yes, that's what mine is on. Will adjustable tub grab bar work for clawfoot tub with rounded walls? BEST ANSWER: While the grab bar worked fine for us, I don't believe it would work on a claw foot tub. We did have to pad the outer edge of our tub since it sloped inward a little. Perhaps a block of wood would fill the gap on a claw foot tub. Thank you for your question. We cannot recommend this for a clawfoot bathtub.We apologize for any inconvenience this has caused you. a tub 9" in thickness? BEST ANSWER: Thank you for your question. We do not have one that will fit a tub that thick. We hope this information will be of help to you.